The J. Marberger Stuart Foundation, Inc.
Alan and Michele Watson from New Zealand were presented with the 2002 DRAGON Award by The J. Marberger Stuart Foundation, Inc. on stage at the grand ballroom of the New York Hilton Hotel at 8 p.m. on July 4th at the S.A.M. Centennial Convention before an audience of over 1400 registered conventioneers. The DRAGON Award is presented in recognition of outstanding teamwork in the art of magic. The award consists of four parts: DRAGON Award medals, the Order of the DRAGON pins, a plaque and a thousand dollar cash prize. Jane Stuart, President of The J. Marberger Foundation, Inc. presented the award to the Watsons. In keeping with the custom of the DRAGON Awards, last year's winners, Paul and Debbie Daniels, welcomed the new winners into the Order of the DRAGON by presenting the medals to Alan and Michele Watson. The DRAGON Award name is taken from the criteria for winning. Recipients must demonstrate outstanding talent in the categories of Drama, Romance, Artistry, Glamour, Originality and Necromancy (magic). The Society of American Magicians Hall of Fame and Magic Museum, Inc. has dedicated a wall to winners of the DRAGON Award. 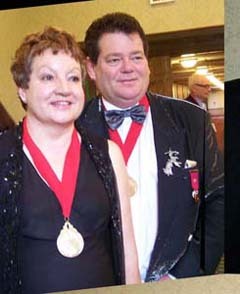 As winners of the 2002 DRAGON Award, Alan and Michele Watson presented an autographed picture to the Hall of Fame for inclusion on the DRAGON Award wall. Representing the Hall of Fame at the DRAGON Award ceremony was Ed Thomas, the incoming President of the S.A.M. and Operations Officer of the Society of American Magicians Hall of Fame and Magic Museum, Inc. Richard J. Stuart, Executive Vice President of The J. Marberger Stuart Foundation, Inc. and President of the Parent Assembly of the S.A.M., presented Ed Thomas with an autographed program of the 2002 DRAGON Award reception to add to the Hall of Fame's collection. Prior to the official award ceremony on July 4th, the 2002 DRAGON Award reception was held in honor of Alan and Michele Watson at the home of Jane Stuart, President of The J. Marberger Stuart Foundation, Inc. The private, black tie event was attended by approximately 50 top magicians from all over the world. Alan and Michele Watson are generally recognized as New Zealand's greatest magicians. They were the first close up magicians from New Zealand to appear at the Magic Castle. The late Bill Larsen, then President of the Magic Castle said that their act was "of the highest quality" and called Alan Watson "one of the finest talents to appear at the Magic Castle." The Watsons performed a repeat engagement at the Magic Castle immediately prior to receiving the DRAGON Award at the S.A.M. Centennial. Congratulations on your marvelous success at the Magic Castle in Hollywood California. My wife Marjorie and I thoroughly enjoyed your show, which we saw many times. We were especially delighted by the style and charm, which shone throughout your entire performance. As a judge of many magic competitions in the United States and Europe, including the most recent FISM, I have been privileged to see many fine magicians. I can honestly say that I consider you to rank among the top magicians in the world. I envy the people of New Zealand who have an opportunity to see your world class magic on a regular basis. Please come to the United States more often. New Zealand should share its star performer with us all. Alan Watson is the International Deputy to the Society of American Magicians for New Zealand. He is also a member of The Magic Circle London (Member of the Inner Circle) with Gold Star. He is also the New Zealand representative for The Magic Circle. He is a multi recipient of the prestigious Benny Award for top magician and the Scroll of Honor from the New Zealand Variety Artists Club. Michele is a talented performer in her own right and also frequently assists Alan on stage in his performances. The J. Marberger Stuart Foundation, Inc. is honored to include Alan and Michele Watson among their roster of distinguished winners of the DRAGON Award.